As you might expect from the name, today’s bread is a Spanish flatbread. But unlike its more familiar and unadorned cousin, the tortilla, a tortillita doesn’t require any other foods to subserve its flavor. 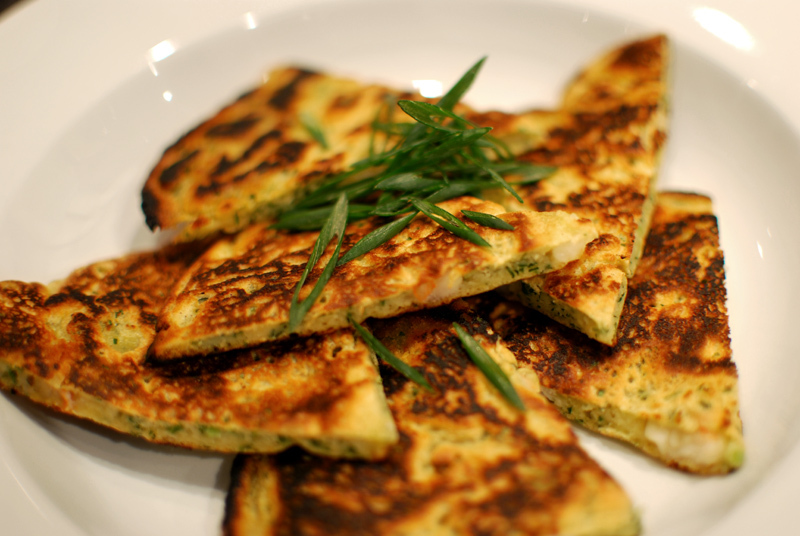 Filled with any combination of herbs, vegetables, meats, or seafood, a tortillita is quite capable of standing alone. This version, taking cues from the Italian farinata, contains chickpea flour and a generous dose of black pepper, giving it a base flavor of sweetness, earthiness, and spiciness all at once. Rounding out the taste is the clean flavor of shrimp and the green brightness of parsley and cilantro. Finely chopped scallions provide depth, while remaining sweetly unobtrusive. The texture is tender, but with a slight chew from the all-purpose flour. Perfectly-cooked bits of shrimp almost crunch beneath your teeth, while the outside edges are delightfully crisp. Lightly charred, these flatbreads provide a smoky counterpoint to a fresh and vinegary salad, for a perfect light meal. 1. In a bowl, whisk together the flours, baking powder, salt, and pepper. Whisk in 1 cup of the water; the consistency should resemble thin pancake batter. If the batter is too thick, add more water, a little at a time. Stir in the onions, chopped shrimp, and herbs. 2. Heat a large nonstick skillet over medium-high heat. When hot, but not smoking, add 1 to 2 tablespoons of olive oil. Pour in enough the batter to nearly cover the pan, and spread gently with a spoon if necessary to form a large pancake. 3. Cook until the tortillita is set and looks dry around the edges, about 2 minutes. Flip over, and continue cooking for another 1 to 2 minutes, until crisp outside but still moist inside. If necessary, flip it again and cook for another 30 seconds or so. Remove from the pan and serve immediately, while cooking remaining batter. 1. The shrimp and herbs may be changed for any other seafood or herbs you like. Scallops, smoked salmon, crab, or any fin fish would all be excellent options. To pair with seafood, thyme, parsley, dill, fennel leaves, mint, or even basil would be good options.